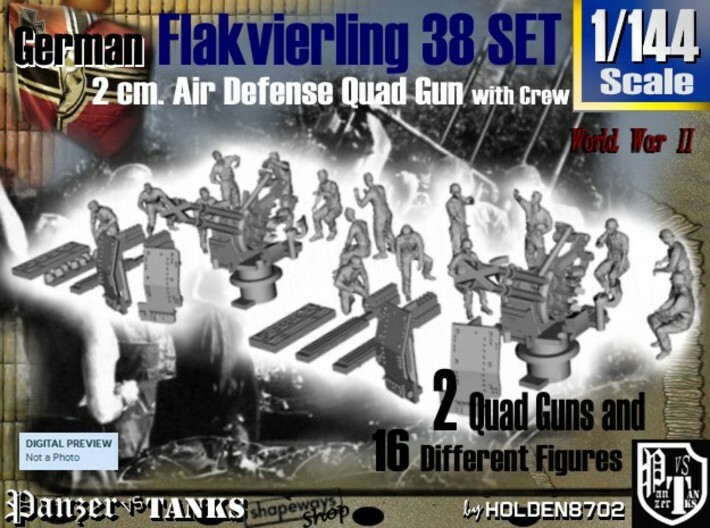 1/144 High Detailed Set of two German Flakvierling 38 2 cm. AA Quad Gun and Crew, with Fixed Mount as used in World War II. Figures wear soft climate shirts, frocks and some are unshirted, with Schiffchen -garrison caps- headgear and Helmets. All the figure poses has been used in my late WWII German Artillery, WWI Airfield and U-Boat Crew Sets, with slight changes and different headgear over all. This set is right to use as Airfield Luftwaffe Defense, Coastal Artillery Defense Bunkers or on Kriegsmarine Naval Units. 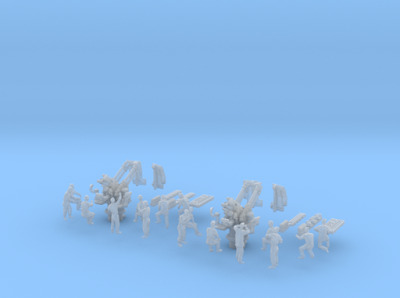 Figures about 12 mm. - 0.49 inches tall when stands up. 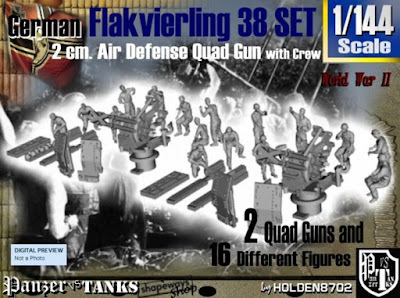 Set includes two complete crews: 2 x 8 men = 16 figures, and also loose gun shields, spare cannon boxes and ammunition box racks. Total 12 parts + 16 figures = 28 parts model. I can re-scale them, because I also have these Flakvierling high detailed designed in bigger scales. Ask for your favourite scale!